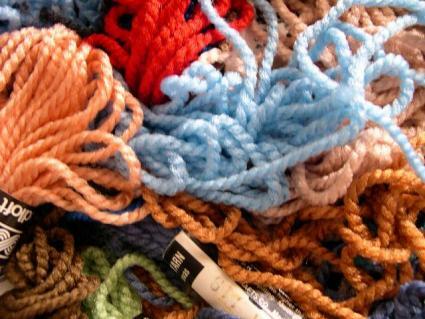 Wool yarn is used for plastic needlepoint crafting. If you're a needlework beginner, it's a good idea to start out with easy plastic needlepoint crafts. Plastic needlepoint canvases are perfect for individuals who are just learning to stitch. Working with designs printed on plastic canvases makes it easy to master the needlepoint skills necessary for more complicated projects. By starting out with simple plastic needlepoint projects, you'll be able to learn the ins and outs of creating beautiful needlework pieces before moving up to fabric designs. Once you've worked your way through a few simple plastic projects, you'll be ready to move on to more advanced needlepoint crafts if you choose to do so. Many people find that they enjoy plastic canvas projects so much that they decide to stick with them instead of moving on to other types of needlecraft hobbies, however. Erica's Craft & Sewing carries several plastic needlepoint kits designed for youngsters who want to learn to needlepoint. The kits are available in several wildlife and floral designs that will appeal to children and adults alike, and they include everything needed to complete the project. Each kit includes a seven point plastic canvas that has the design printed on it, wool yarn, a needle, a mat, and a frame. You may order online, or visit the Erica's Craft and Sewing store in South Bend, Indiana. Shopping on eBay is a great spot to find easy plastic needlepoint crafts. On any given day, you can find auction and "buy it now" selections of plastic needlepoint canvases, kits, and supplies. Once you start creating your own needlepoint crafts, you're likely to fill your decorating needs in no time at all. Fortunately, most people appreciate the beauty of handmade needlecraft pieces. Handmade needlepoint pieces make lovely gifts for co-workers, teachers, brides-to-be, expectant mothers, and others. When you are a skilled needlepoint hobbyist, you can utilize your skills to create beautiful holiday and special occasion gifts for your friends and relatives. If you're particularly ambitious, you can even create needlepoint pieces to sell. Many crafters take orders for completed pieces, or sell their work through local stores, consignment shops, and craft shows. It's up to you to decide if you want to continue to enjoy needlepoint primarily as a hobby, or if you want to build a business based around your crafting skills.